Well hell, how could I not? Try reading some of the idiot comments on America at the end of the article. Like one guy who vows to never visit the USA. Oh, we are gonna miss that. When do we cry? This is one of more than one on the subject of those awful Yanks and their gun crazed country, in the same issue of the Mail. Which btw is not a liberal paper. Anyway, see ALL the photos. Most are obviously meant to show gun owners in a less intelligent light. There are quite a few. And so the seeds are carefully planted to show how wrong and out of step we are and morons buy into it ALL. Following the shocking murder of 20 children and seven adults at Sandy Hook last week, the debate surrounding gun control laws in the U.S has been reignited. This week President Obama has promised to bring in reforms while the powerful gun lobbyists the National Rifle Association says the answer is for armed security officers in schools. In this series of eye-opening pictures, gun-owning Americans pose with their deadly arsenal of weaponry and explain why they feel the need to bear arms. There are a total of 226 replies but look at rating at this first comment. 2217 was the number of those who approved the comment. The most powerful nation on earth with the highest population of idiots. I couldn’t imagine keeping a gun in my home. The US are gun crazy and this is why these tragic shootings happen. Look how proud they look with their guns, pathetic! You need gun laws like the uk and maybe things like that wouldn’t happen! The pictures with kids in are so irresponsible it reminds me of images we see of the taliban kids, its disgraceful how one person can be allowed to own so many deadly weapons. 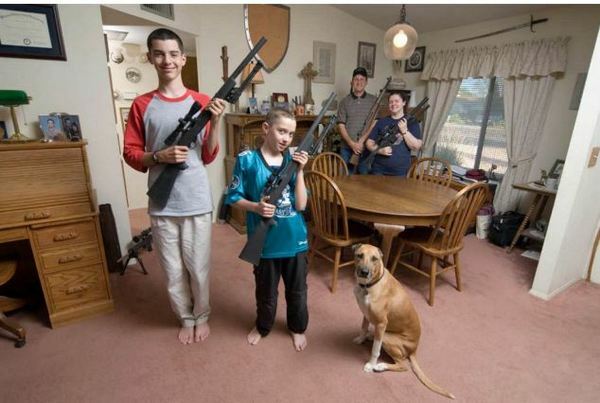 What scares me the most about this articles are the children posing in the photo’s with a firearm in their hands. Complete madness. I`m just glad that I live in Beautiful Blighty. Stupid, stupid people. Thank God I haven’t the slightest desire to travel to the nut-house that is America. Why they will offer a seat to the intruder and offer them tea and suggest perhaps the bad guy would like to discuss things with the intended victim. This reasoning tho is a favorite. Take a look at this fool. ‘I figured that since the bad guys had guns, I should have one, too’ 2 wrongs dont make a right.